Use social networking and online collaboration tools to deliver targeted and dynamic content to employees for faster, more personalized online communication. Provide access to integrated web services to make your company intranet easier to learn and use. Employees can also access information and applications securely on-site and through mobile devices. Deliver current, relevant information to employees using shared documents and content libraries. 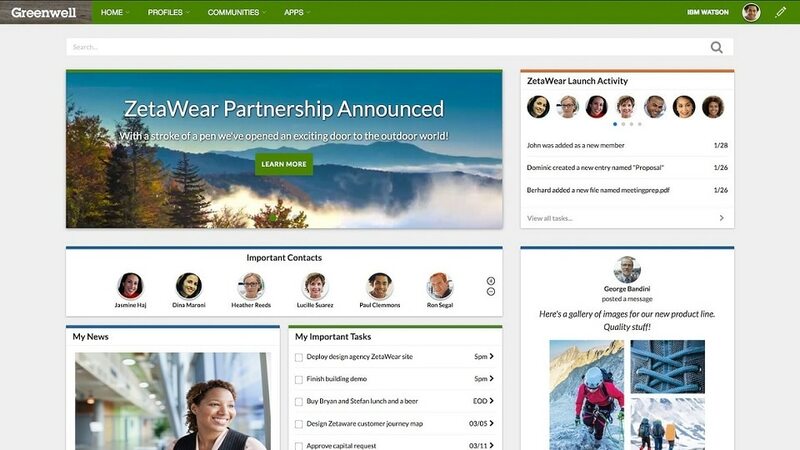 Allow business users to easily create and publish intranet content, while employees can evaluate information without leaving the currently displayed intranet page. The solution also enables you to analyze employee interactions, trends and activities to help verify and improve the online experience. Use web portal services based on role-based criteria to aggregate selected applications and content. You can also incorporate electronic forms into your intranet to automate forms-based processes, which can improve employee efficiency and responsiveness. The solution can deliver standards-based applications with intuitive, interactive interfaces. Build a single, integrated digital employee experience environment across multiple platforms and devices, allowing employees to collaborate from any location using the tools they want. The solution allows you to reuse existing software or components, and take advantage of sample intranet templates for faster deployment. You can also choose the combination of authentication, authorization and single sign-on that best meets your security needs. Use tags to aid searches, enabling users to find expertise, projects and other content. Benefit from pre-built templates that allow users to quickly gather and present ideas, and create, edit and publish content. Define goals, and share near real-time metrics using composite, role-based dashboards and scorecards. Portal-based dashboards allow you to deliver and share key performance indicators (KPIs) with employees to help your organization improve overall performance. Latest version of Apple Safari on Mac and iOS, Google Chrome or Firefox on Windows, Linux, and Android.